For instructions on accessing student STAAR scores, please click on the headline. Weatherford ISD has hired Dr. Jeffrey Bradley as the new Associate Principal for the Weatherford High School Ninth Grade Center. Dr. Bradley served as Principal of Keller High School from 2011-2014 and most recently served as the Director of Learning Resources for Keller ISD. Dr. Bradley holds a Bachelor of Mathematics and a Masters of Education in Secondary Education, both from Texas Christian University, and a Doctorate in Educational Leadership from the University of North Texas. 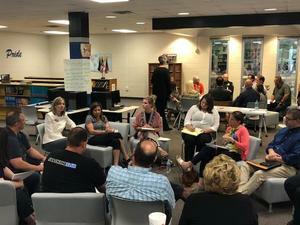 Creating a safe and secure learning environment for our students and staff is a priority for all Parker County public schools and local law enforcement. Today we were honored to host this month’s Parker County Safety Summit where we discussed safety processes and shared best practices. At the Regular Meeting of the Weatherford ISD Board of Trustees held on June 11, 2018, the Board approved additional safety measures that include a concealed carry program for staff. Please click on the headline for additional information. 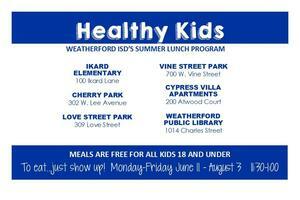 Weatherford ISD's Healthy Kids summer lunch program kicks off on Monday, June 11, 2018! The program offers free lunches to all area children who are 18 years old and younger. Over the course of the summer, children will enjoy a variety of hot baked entrees - including popcorn chicken, chicken nuggets, and sandwiches - along with fruits and vegetables. Funded through a Texas Department of Agriculture program, the meals are prepared by the school district and meet all federal and state nutrition guidelines. Weatherford ISD mourns the loss of former student, Charlie Contreras who passed away Wednesday, June 6, 2018. Funeral services are 10 a.m., Saturday, June 16, 2018 at Galbreaith Pickard Funeral Chapel with interment to follow at East Greenwood Cemetery. Visitation is 6-8 p.m., Friday, June 15, 2018 at the funeral home. It is with a heavy heart that we announce services for Aileen Akbar, former ESL Parent/Teacher Liaison at Weatherford High School. She was beloved by parents, students, and teachers. In lieu of flowers, the family has requested donations be made to the Project Opportunity Scholarship Foundation, a scholarship program to help Weatherford High School students to attend Weatherford College. Contributions can be mailed to: Project Opportunity Scholarship Foundation, c/o Charlotte LaGrone, 1100 Longhorn Drive, Weatherford, Texas, 76086. Thursday, May 31 is the last day of school and an early release day for all campuses: Elementary dismissal 11:45 am; Middle School dismissal 12:05 pm; NGC/WHS dismissal 12:15 pm. Summer fun is just around the corner with the Kids Unite Camp. KU Camp is available to students entering grades K-8 and runs from June 11 - August 3. Register your child today!